Residents in a Chinatown nine-storey building are fed up over a broken elevator, which has been out of service for months. Solheim Place, which offers 86 affordable housing units, has two elevators but one of them hasn’t worked since September 26, 2018 while the other only goes up to the sixth floor. As a result, the tenants, many of whom are elderly or have mobility issues, must climb the stairs to get to their units on the upper floors of the building. 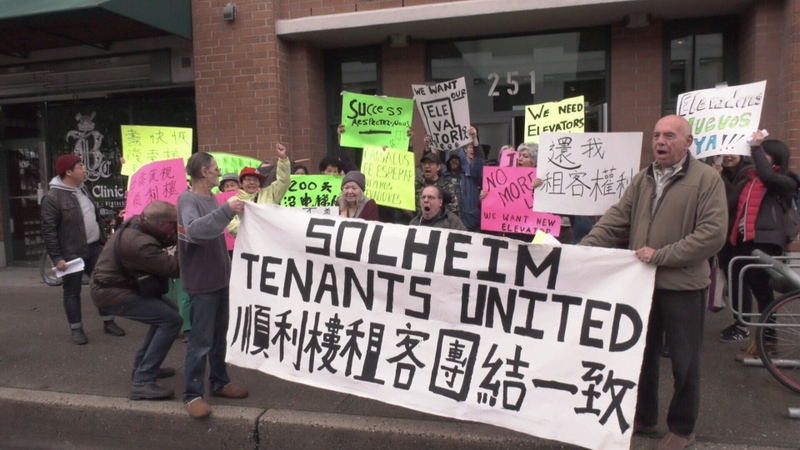 On Saturday morning, tenants held a protest in front of their home, demanding the landlord fix the elevator immediately. "This would never happen in a market building; this would never happen in a luxury condo building. It's because many of the tenants, they’ve said themselves, that it's because we're disabled, we're poor, we're seniors that they think they can take advantage of us," said Nat Lowe, one of the rally organizers. The building is owned and operated by S.U.C.C.E.S.S., a non-partisan and non-profit organization, which has an agreement with BC Housing. Resident Lisa Thys said she is frustrated by the lack of inaction from the landlord. "To put it politely, it's extremely bad," she said. "They keep saying they're working on it …which I have not seen." She says that some of the residents have even hurt themselves because they’ve been forced to climb so many stairs. "There have some people that have gone out using the stairs and have fallen and gotten badly hurt." S.U.C.C.E.S.S. has posted a statement on its website, explaining the elevator broke down because of "old age and wear." It said it has taken steps to provide support to tenants by extending the staff's shifts until 11 p.m. to help carry items up and down the stairs, placing chairs on each floor, working with BC Housing to find accommodation in other buildings and offering tenants in upper floors first priority to move to other units. Nicholas Yung, another rally organizer, accused S.U.C.C.E.S.S. of not stepping up as a landlord and is putting the blame on BC Housing as to why the issue is taking this long to solve. "They haven't mentioned anything about the timeline and their lack of management and lack of care of the elevator for the last many years," he said. In a recent meeting with the landlord, they learned it would take another seven months to come up with a plan and then four more months to do the repairs. "That's not good enough. Definitely not good enough and that's their estimation, it could be longer." S.U.C.C.E.S.S. told CTV News it will be offering financial compensation to some of the affected residents.